Tigers Race to NIHL North Cup Win. Hexagon Telford Tigers 1 took a long road trip to Edinburgh to play Murrayfield Racers in the NIHL North Cup. Tigers had lost the previous evening 5-2 to Sheffield Steeldogs and were looking to get back to winning ways after their first defeat in the competition this season. Tigers started without Denis Bell, Warren Tait and Jason Silverthorn but were able to add Joe Aston to the line up after his 4 game suspension had ended. Tigers could have been forgiven for starting slowly after their long journey, but instead, they flew out of the blocks. Corey Goodison’s shot from the blue line opened the scoring in the 4th minute. This was closely followed by 2 goals in 50 seconds when first Scott McKenzie scored and then Dan Mitchell netted to give Tigers a 3-0 lead after just 8 minutes of the game. Doug Clarkson then scored Tigers’ 4th goal with a precise shot into the top corner. As the period ended Murrayfield got off the mark with a goal from Joel Gautschi to cut Tigers’ lead to 4-1. Tigers started the 2nd period well and added a 5th goal in the 24th minute. Brodie Jesson with a neat finish after being set up by Joe Hazeldine. The rest of the period was even and saw no more scoring. Tigers would take a 5-1 lead into the 3rd period. 4 minutes into the final period, Tigers added a 6th goal, Jack Watkins scoring. Less than a minute later Clarkson scored his 2nd goal of the night for Tigers’ 7th. In the 54th minute Tigers changed net minder with Tom Hovell being replaced by back up Ryan Lewis. Tigers then scored two quick goals to finish the game. Jack Watkins adding the 8th and Scott McKenzie the 9th. The win means Tigers climb to 3rd in the cup table after 5 games played. 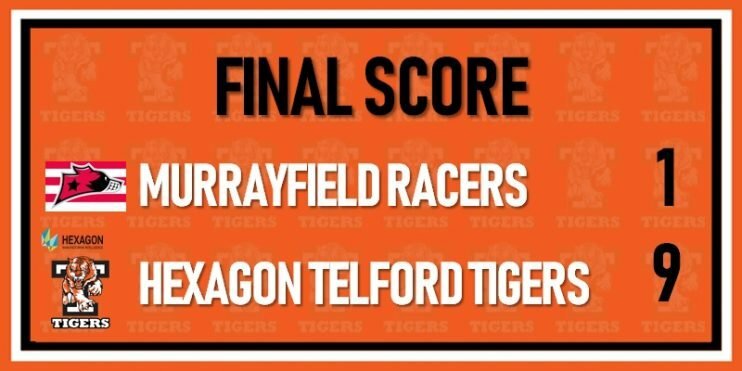 Final Score: Murrayfield Racers 1 Hexagon Telford Tigers 9. Scorers: Scott McKenzie (2), Jack Watkins (2), Doug Clarkson (2), Dan Mitchell, Brodie Jesson and Corey Goodison. Hexagon Telford Tigers 1 next play at Telford Ice Rink Saturday 3rd at 19:00 in the NIHL North Cup against Murrayfield Racers. Hexagon Telford Tigers 2 return to action at Telford Ice Rink on Sunday 4th at 18:00 in the NIHL Laidler Conference against Deeside Dragons.